You know what audiences are begging for? A musical about the Holocaust! That is completely and one hundred percent facetious. In fact, why even tread the waters of the time? A good story. The Gold isn’t necessarily a Holocaust musical. 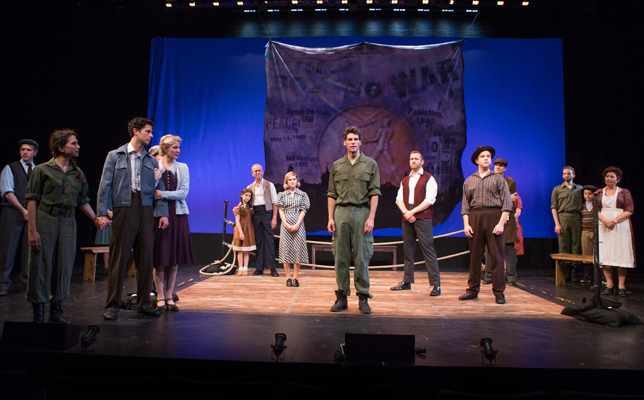 The Holocaust is a backdrop for the show with music and lyrics by Philip Yosowitz and book by Yosowitz and Andrea Lepcio. This is a musical about remembering. Oh yeah, and a little boxing. Spanning decades, The Gold follows the rise of Joseph Cohen, a Jewish man living in Germany, as he sets his eyes on the 1936 Olympic Games. When love, lust, and the rise of the Nazis prevent Joseph from the gold, his world is turned upside down when his family is taken to Concentration Camps. To protect their young son Aaron, they send him to live with their German friend. Jump ahead years, Aaron is now a boxing prodigy who finds himself training for the Olympics in Israel, the same place his long lost father is. The reason many people go to musicals is for the music. That’s the thing we remember. Unfortunately for The Gold, the score is not something memorable. It’s a very old fashioned musical with a sweeping epic score that is dated. It’s logical to try and be the next Les Miserables but fulfilling that dream is hard to do. The Gold sadly did not. Even if the score had some grand moments, what is holding the show back is the book. The Gold needs a facelift. But it needs a script doctor, and one beyond a plastic surgeon. For starters, the dialogue is silly and the timeline is laughable. Yes, Yosowitz and Lepcio try desperately to incorporate many milestones and moments in Joseph and co.’s life. But when you go from first date to first kid within scenes, you can’t help but have a look of bewilderment. And this happens so frequently. The Gold must be trimmed, perhaps losing some characters and cutting some songs. Just because you like the melody doesn’t mean you need a reprise. Even with the structural changes, the dialogue must be improved. This company is filled with talent but some of the words that rolled off the tongue had shades of bad community theater. To no fault of their own. It’s what was on the page. Even with cosmetic changes, will it be enough? Like many classic musicals, The Gold featured a large cast with an ensemble relegated to playing those typical ensemble roles. They provided a wall of sound that gave Yosowitz’s score substance. Even with thin characters, there were some solid performances. Through strong subtleties, Josh Davis easily gave Joseph Cohen a life from youngster to a man who's seen the horrors of the world. The power in his voice elevated Yosowitz's music. As his wife Sarah, Karis Danish provided strength and determination, even inserting a flare of pluck. Jenn Malenke’s Gabrielle was placed in a tough position. Being the sister of Joseph’s rival and being Sarah’s best friend, Gabrielle was always forced to do something difficult. And when she was asked to be the Joseph and Sarah’s son’s caretaker, her life too was turned upside down. Malenke’s character wasn’t given substance in the text but she sure did try to give worth Gabrielle. And it was appreciated. Having kids in a show is hard. As Young Aaron and Young Julie, Graydon Peter Yosowit and Stephanie Ticas won over the crowd with their cuteness and impressive vocals. Yet they also managed to pull focus from the overall arc of the story. By the time we saw the adult versions of Aaron and Julie, played by Adam Maggio and Emily Kron, it’s likely you were over them. The pen pal plot line desperately needs to be shrunk so when it gets to Maggio and Kron’s time as the characters they don’t have to force an arc in causing their performances to suffer dearly. Spiro Veloudos had a grand task in directing The Gold. Making sense of the overall picture seemed to be on the backburner, instead choosing to hone in on the individual plot points. Veloudos’ puzzle did not fit together. He was inherently given some roadblocks to drive around but seemingly paid little care to them. Veloudos and lighting designer Joe Beumer chose to go a quick black after every single scene. Kudos for keeping a consistent vocabulary but man was it repetitive. Was this to help with the scene changes? If so, then scenic designer Meganne George faltered in her design. With Veloudos’ tempo being an issue, having to wait for a table and chair, sometimes making an appearance for a book scene less than a minute long, destroyed any semblance of momentum. Musicals thrive from applause. When the audience doesn’t applaud after a song, you know there’s an issue. And let me tell you, it’s hard to clap after a Nazi song. Doesn’t matter how triumphant the sound is, it’s a song about Nazi pride! The same goes for dramatic plot points, like a death in a Concentration Camp. You’re not going to get claps. Is there a way to avoid this in this particular story? No. As crazy as it sounds, the lack of applause can also deter a continuous flow. Veloudos’ staging, for the most part, was confined to the boxing ring George set up. Was it strange to have people step inside the ring when they probably shouldn’t be in there? Yeah. But that’s the design. I suppose it can be forgiven. What can’t be forgiven is the intentional, or unintentional, ode to Les Miserables. Never can you ever wave a flag and not compare it to Les Mis. That Israeli flag waving killed the message of hope within the scene as it immediately upstaged itself. The Gold has problems. Some fixable. Some unavoidable. The story Philip Yosowitz and Andrea Lepcio set out to tell is confusing based on synopsis alone. On the surface, you want to make it the next Rocky. But it’s not a boxing musical. There is a message of hope but it has to be sold as a Holocaust musical. And unfortunately, that’s not a draw.